What can 85 dots create? Counting, writing and drawing practise are wrapped up in this dot-to-dot coloring page. Follow the numbers with a pencil to reveal a prehistoric animal! Complete the picture of the toothy T-Rex and practise your counting skills by connecting the dots from 1-45. 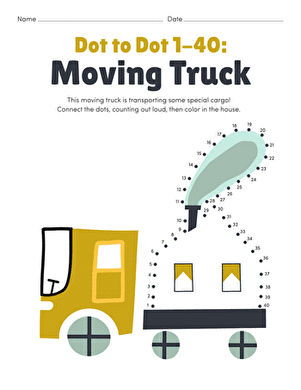 Help your first grader practise counting with a tugboat dot to dot. Skip count by 10s to complete a dot-to-dot picture of a mining truck. 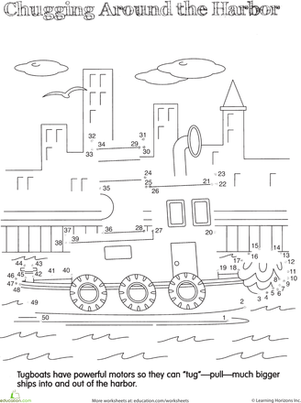 Counting, writing and drawing practise are wrapped up in this dot-to-dot coloring page. What Australian animal will be revealed? Can your child figure out what animal is hiding in this dot-to-dot? Hint: It's the tallest mammal in the world! Skip count by 2's to complete a dot-to-dot picture of a cement mixer. 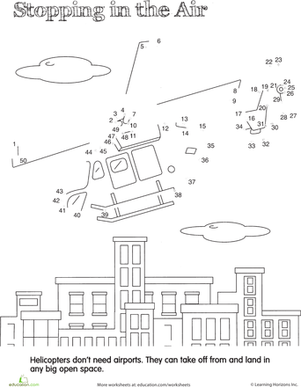 If your child loves all things vehicles, he'll enjoy this garbage truck dot to dot. Hmm, something is fishy with this dot to dot puzzle. It must be April Fools' Day! What has 83 dots and knows how to whinny? This animal dot-to-dot gets your child to sketch the outline of a show jumper, while getting some number practise too. Connect the dots from 1-50 to reveal a hovering helicopter.